Running has certainly been in the spotlight lately, especially with all the IRONMAN hype we’ve seen in Tremblant! When training, however, the emphasis is too often put on the distance and length of the run. What about the speed? An interval workout, high in intensity, is a well-known way to increase muscle endurance and cardiovascular strength. Plus, you’re maxing out your workout time, since the shorter run is more representative of the average ski or snowboard run. Now to really get you going, imagine being chased by a zombie! The chase exercise is a fantastic way of stimulating a shorter but faster race. The idea behind the game is to not let the zombie catch you! Around a circuit, the racers would start at intervals, one at a time, with the slowest leaving first and the fastest last. The time between the individuals can vary, but we recommend a 10-second lapse. You can also adapt this gap according to the caliber of the racers. 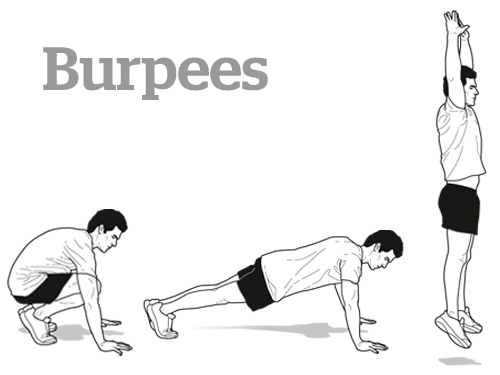 Of course, when a person is overtaken there will be a consequence: BURPEES! Be careful! You’ll want to take a good 3- to 4-minute break before the next lap. The point here is speed, not distance. You can change the order of individuals if needed and then do the exercise 2 or 3 times. – A 200- to 500-metre circular long running track. – At least two racers. If you are by yourself, you can download the Zombies, Run! application on your mobile device. Very popular in the running world, the app emits zombie cries that get louder as they are gaining on you. They catch up depending on your speed and step length. Amusing: make crazed zombie noises as you’re gaining on your friends and see them work even harder to not get caught! Why run in the winter? Why not!